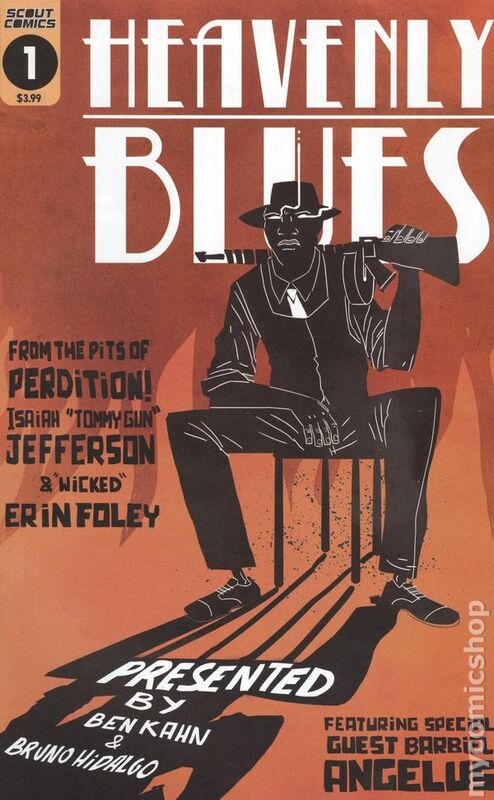 51 Minds has acquired the rights to adapt the groundbreaking comic book series, Heavenly Blues, from Scout Comics & Entertainment. You can still find some at cover price here. The news just came out so there has not been many sold on on eBay . There are several exclusives, including a NYCC one , which are reasonably priced. Created and written by Ben Kahn with art by Bruno Hidalgo, Heavenly Blues is published monthly by Scout Comics, with issue #3 hitting comic stores this past Wednesday. An OCEAN’S ELEVEN-type story set in the afterlife, this stylish, commercial, and organically diverse crime-adventure story is centered on the greatest thieves in history – a witty team consisting of a 1920’s mobster, an Egyptian grave robber, a Salem witch, a 16th century Ninja, and an outlaw from the Old West – who team up to pull the ultimate heist for an Angel in heaven, in order to finally escape an eternity in hell. Book was not originally published by Scout, so #1 copies are not the original first prints (if that makes sense). Was self published first. Easy identifier is the self published copies are missing the Scout logo in upper left. Any idea where to find one of those? Damn near impossible, I figure. He sold out of the self published a long time ago. I tried buying directly from Ben a while back when I first caught word it was going to be Optioned. What a cool concept. I would like to read that story. I have the first and second issue listed on eBay, actually. I had a feeling about the series and also held onto another copy of #1 to see if my inkling of it possibly getting hotter proved too, so yah! For those seeking the self-published book. But as Anthony pointed out, he sold out a long time ago, so the point is moot.